New Hybrid Literacy Program is a collaboration of local, regional and state-wide partners and resources – more than $20,000 donated to start program. 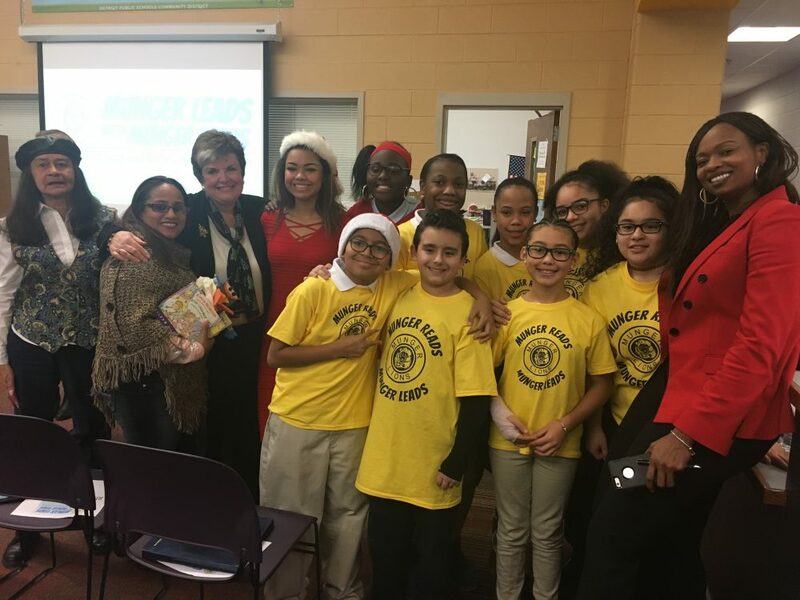 DETROIT – December 19, 2017 – Detroit Public Schools Community District’s Munger Elementary-Middle School and community partners are launching a pilot program for families and students to address early childhood challenges with resources ranging from prenatal care to critical developmental tools for children ages 0 to 3, and preschoolers through third grade – with an ultimate goal of increasing literacy proficiency. Through the generous financial support of Paul and Amy Blavin, Brilliant Detroit will become a Raising a Reader affiliate and Raising a Reader will be incorporated into the services and programming. This program targets both children and parents in literacy efforts. 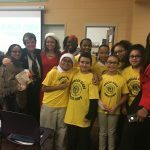 Munger Leads when Munger Reads will kick off in January at Munger Elementary-Middle School and its surrounding neighborhood. This pilot program establishes a collaboration of existing community organizations and resources along with Munger school staff to provide a hybrid model of additional support to 100 families and approximately 80 volunteers. Create a literacy-focused community in the Munger neighborhood. Provide parents with information and strategies to strengthen language skills in their children. Language skills are the foundation of literacy skills. Ensure children possess grade level readiness when they enter Kindergarten at Munger. Empower parents to teach, talk, read, and play with their children every day. Great Start Collaborative Wayne will provide training for parents and community members and will also coordinate a neighborhood-wide language and literacy campaign. is a partner in the pilot and the families involved in this home visiting program will also be part of the Raising a Reader initiative. Wayne RESA is a proud partner working with Detroit Public School Community District and families to best prepare young children for success in school and in life. The Great Start Readiness Program is Michigan’s state-funded preschool program for four-year-old children with factors which may place them at risk of educational failure. Together we are committed to leadership through service and collaboration for excellence in teaching and learning for all. Munger houses four Great Start Readiness Program classrooms serving 72 children and families. Within Munger, the principal, assistant principal, staff, and parent network were instrumental in developing the framework for support at the school. The District will provide additional support for Munger’s teacher training initiative. Additional support includes tutoring for students, English as a Second Language classes for parents, volunteers to assist with the school’s existing attendance and parent engagement programs, afterschool programs and clubs. Evaluation and tracking of Munger Leads when Munger Reads will be performed by a workgroup consisting of Poverty Solutions at the University of Michigan, Brilliant Detroit and DPSCD. “The success of our children really depends on a community-wide approach to education, starting with early childhood learning. The Munger Leads when Munger Reads pilot program is an excellent example of a wide range of support systems coming together in a focused way that I hope to see replicated across our city,” said Mayor Mike Duggan. Munger Leads when Munger Reads subgroup partners include: DPSCD Munger Elementary-Middle School staff and Parent Teacher Association; Great Start Collaborative Wayne; United Way of Southeastern Michigan; Authority Health – Nurse Family Partnership program; Henry Ford Health System; Wayne RESA; Southwest Solutions; Brilliant Detroit; Business United with Officers and Youth within the 4th Precinct of the Detroit Police Department; Detroit Fire Department Ladder 22; Poverty Solutions at the University of Michigan; Michigan Department of Health and Human Services – Pathways to Potential and Field Operations Administration; City of Detroit Office of Neighborhood Revitalization, District 6; Grosse Ile Presbyterian Church; Office of Governor Rick Snyder; Maura Corrigan; Paul and Amy Blavin; and Wayne County Commissioner Ilona Varga. This entry was posted in Info News Center, News and Press Releases and tagged 224, Academics.